I decided to watch some movie this Sunday, and we were stuck if we're going to watch How to Train Your Dragon in 3D for an hour and a half with double the price or watch something else. 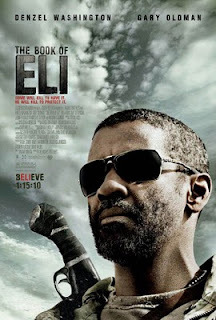 My friend advised to watch The Book of Eli even she watched it already since she wanted to watch it again. I am not a fan of Denzel Washington movies but I know that he's one of the actors who has a lot of quality movies under his belt. 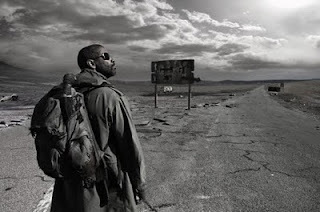 The movie was set in a post-apocalyptic world. The story revolves around Eli (Denzel Washington), a traveler who has been on a journey. He shows a high level of survival skills from hunting and has developed unbelievable killing skills. Upon reaching a small town, he ran into some fight with the thugs in local bar. This event caught the attention of Carnegie (Gary Oldman) who runs the small town and offered him a place in the town and work for him as one of his guards. Eli refuses and was offered to stay for the night and Solara, daughter of Carnegie's lover, was tasked to sleep with him. Eli refused to do so but instead taught her how to say grace before a meal. Upon returning to her mother, she imitated what Eli did before eating and Carnegie was able to conclude that Eli has the book he had been looking for a long time. Eli has in his possession the last copy of the Holy Bible because every copy of it was destroyed during the war. A shoot-out ensues when Carnegie tries to ask Eli to hand over the book to him and the latter refuses. Carnegie was wounded and Eli was able to leave the town, tagging along with him is Solara. Upon getting enough water from a secret spring Solara led him into, he trapped her so as to prevent from following him. Being a persistent due to her curiosity, she was attacked by desert thugs but was save by Eli, he decided to let her come with him. Carnegie was able to catch up with them and a gunfight ensues forcing Eli to surrender the book to Carnegie when he threatened to kill Solara. Solara was able to escape Carnegie and was able to pick-up Eli still continuing going to the west without the book. They were able to reach Alcatraz and informed that they have copy of the King James Version of the Holy Bible. The surprising part in the end is when Carnegie discovers he cannot use or read the Bible he got from Eli and how Eli was able to give a copy of the Holy Bible to Lombardi, who acts as a curator of the place. You will notice as you watch the movie that it was presented with less color to show signs of desolation. Like any post-apocalyptic film, the desert was primarily the back draft. San Francisco was briefly shown with destroyed skyscrapers during the ending part of the movie. Fight scene was wonderful since the film-makers was able to show cutting of body parts and decapitation on a quick style but not is a bloody manner. It was also released that Washington did all his martial arts move under the training of Dan Inosanto. There were two lines that strike my attention. The first one was when Solara asked what was the world like before the war and the "flash". Eli said "People had more than they needed. We had no idea what was precious and what wasn't. We throw away things people will kill for now." It is also shown how small things like a lighter, old shoes, a pair of hand gloves is used as an exchange for services and precious commodities like water. My lesson learned: We should not take the things we have today for granted, we may never know when it will be gone. The second line is when Eli answered "To walk by faith not by sight" when Solara told him that he might be going the wrong way. It was actually double meant in his part. I was not able to grasp what he said until the end of the film. You have to watch it to know what I mean, it will surprise you when you discover why he told her that.